The center is pleased to welcome four new mid-career professionals from UNICEF, all of whom will pursue a certificate in child protection through the Harvard/UNICEF Child Protection Certificate Program. This year, course offerings within the curriculum have been broadened to reflect the complexity of the child protection field and are being offered not only at Harvard TH Chan School of Public Health but also at Harvard’s Kennedy School, Divinity School and Graduate School of Education. 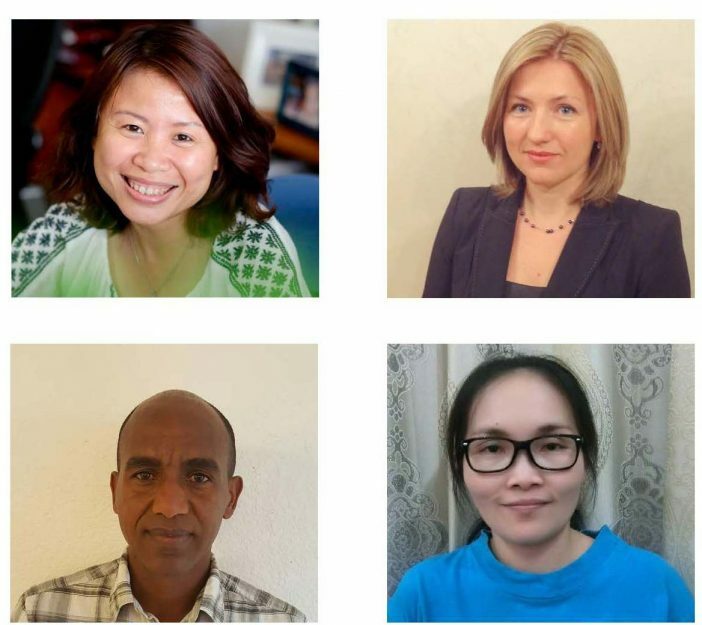 This year’s fellows hail from four countries–Eritrea, Lao, Ukraine and Vietnam–and, as always, bring a rich wealth of experience and perspective to the classroom. Below is a brief introduction to each. Samuel Isaac’s professional interests include protection of children from harmful traditional practices such as female genital mutilation/cutting, child marriage, and the concealing of disabled children. He is also interested in strengthening the family unit as a safety net for orphaned and vulnerable children and supporting children with special needs to access basic social services. At UNICEF Eritrea Isaac supports diverse projects designed to protect children from abuse, exploitation, and harmful practices, from their initiation through to their implementation, monitoring, documentation and evaluation. Isaac holds a master of arts from the University of York and a bachelor of arts in economics from the University of Asmara in Eritrea. Before joining UNICEF Truc was a senior legal specialist at the Ministry of Justice of Vietnam with 18 years of experience in legal and judicial reform. During her tenure at the ministry, Truc was directly involved in drafting and appraising a number of key pieces of legislation pertaining to child protection and justice for children. In her current capacity she provides technical advice to support the Vietnamese government’s reform of its legal and institutional framework, aimed at building a justice system that better serves and protects the rights of children in contact with the justice system. Nguyen holds an LLB from the Hanoi Law University (1990) and an LLM from Nagoya University Graduate School of Law (2002). Phet, a child protection officer at Lao People’s Democratic Republic, is passionate about the wellbeing of children and families and their protection and development. As a G. Barrie Landry fellow she is committed to continuing her own personal development and to helping children achieve their fullest potential in her country. Sayasane holds a master of applied social work from Massey University, New Zealand; a diploma of business administration from Swinburne University of Technology, in Australia; and a bachelor’s in English teaching as a second language from the National University of Laos. With over 15 years of experience in child protection, Ruslana began her career as a practicing lawyer, followed by a specialization in criminal justice at the University of Cincinnati and years of continuous work with state child protection agencies in the United States. Sirman’s hands-on experience enabled her to become an effective leader of the UNICEF national juvenile justice program in Ukraine after her return to her home country in 2010. In her current function, Ruslana co-designed and facilitated a multi-year, high-level government working group on the prevention of torture and ill-treatment of children in contact with the law. Her work at UNICEF also includes addressing issues related to child care reform, human rights, and, most recently, supporting government and civil society organizations to establish systems to address the needs of conflict-affected children and their families in eastern Ukraine. Ruslana holds a JD from the Chernivci National “Juriy Fedkovyc” University and an MS in criminal justice from the University of Cincinnati.